On Sunday February 3, either the Baltimore Ravens or the San Francisco 49ers will lift the Vince Lombardi Trophy as winners of the biggest single sporting event in the world: the Super Bowl. The trophy is named in honor of a man who inspired a losing team to become an unstoppable winning franchise. Vincent Thomas Lombardi was born in Brooklyn, N.Y. in 1913. When he was fifteen-years-old, he entered a six-year program to become a priest. After two years, he left the program and pursued his love of sports. He received a scholarship to play football at Fordham University in Brooklyn. Lombardi went on to play semi-pro football, but never played in the NFL. His first coaching job was at St. Cecilia Catholic high school in Englewood, N.J. In 1954, after coaching army football at the U.S. Military Academy at West Point for five years, Lombardi got his first coaching job in the NFL as an assistant with the New York Giants. In 1958, Vince Lombardi became head coach of the Green Bay Packers. The season before he was hired, the Packers had won only one game. Lombardi had never been a head coach in the NFL, but he was confident he would turn this team around. Lombardi is a legend now. But in 1958 he was a man who had something to prove. In his first speech to his new team, Lombardi said, "I have never been on a losing team, gentlemen, and I do not intend to start now." True to his word, the Packers went on to a 7-5 record. In 1960 the Packers won the division title, but lost the NFL Championship game (the precursor to the Super Bowl) to the Philadelphia Eagles. Lombardi didn't take to losing and said that losing a championship game was unacceptable and it would not happen again under his command. It became clear that when Lombardi made a proclamation, he meant it. In 1961 and 1962 the Packers won the NFL Championship. Then in 1967 the Packers beat the Kansas City Chiefs in the first ever Super Bowl. The winning continued for Lombardi, as his Packers went on to win the second ever Super Bowl against the Oakland Raiders. Lombardi's record as head coach was 94 wins and only 36 loses. In ten years as an NFL head coach, he never had a losing season. Vince Lombardi's legacy in the game of football is huge. But his legacy as a motivator is even bigger. Lombardi was a man who could inspire people with his words. He once said, "Leadership is based on a spiritual quality; the power to inspire, the power to inspire others to follow." 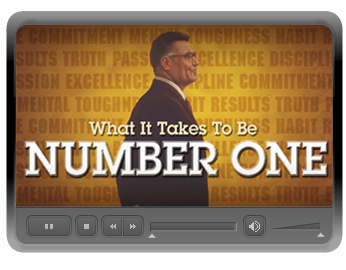 Please enjoy the video provided by Simple Truths and let Vince Lombardi inspire you to succeed.